In the novel I’m working on, tentative title Luke’s #1 Rule, people misunderstand each other’s motives all the time. Chloe’s mom, Ursula, thinks her daughter and grandkids are leaving the state to get back at her for moving a few hours away, and for not continuing to provide Chloe with free housing, home cooked meals, and babysitting. In Chloe’s mind, nothing could be further from the truth. She knows it’s time to stand on her own feet and raise her boys by herself. Her mom’s decision just urged her to do what she knew all along had to be done. Staying with your mom when you’re thirty-something is not Chloe’s idea of success. But her mom made it easy, her sons were happy, and she knew they were being well cared for as she re-entered the working world. Now Chloe has the opportunity of a lifetime and she’s taking it even though it will move her far away. Chloe needs to provide for her children, and this job has great health care, benefits, and a salary twice the size of her current position. Her ex-husband is a loser without a job. He’s also got a drug and drink habit fit for a rock star. Chloe wants to get as far away from him as she can. She doesn’t want her boys exposed to her ex’s dysfunctional and destructive lifestyle. The chess pieces are on the table and the players have no idea what move the other will make. Ursula pulls a bold move with the help of a friend, setting Chloe up with her pal’s handsome son. There are too many mixed signals between Chloe and Luke to count. Luke is a bit of a mystery man. What’s his motive? Chloe isn’t sure. He keeps her off balance, because his emotions are in turmoil, too. Nobody quite knows what anyone else is up to. Even her ex has a strategy to thwart Chloe’s ambitions. And isn’t life like that? Some people may not even be conscious of the reasons behind their behavior. Like today, when I wrote about my novel-in-progress instead of the novel that’s just been published. Mixed message. Honest mistake. 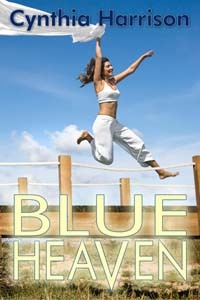 My current release, Blue Heaven, also has a couple, Eva and Daniel, who send each other mixed messages on their path to true love. One character deliberately sets out to manipulate Eva. She can’t be sure who has betrayed her, she just hopes it’s not Daniel. Blue Heaven is on sale exclusively at Kindle for three months and, best of all, will be free the first five days of October.